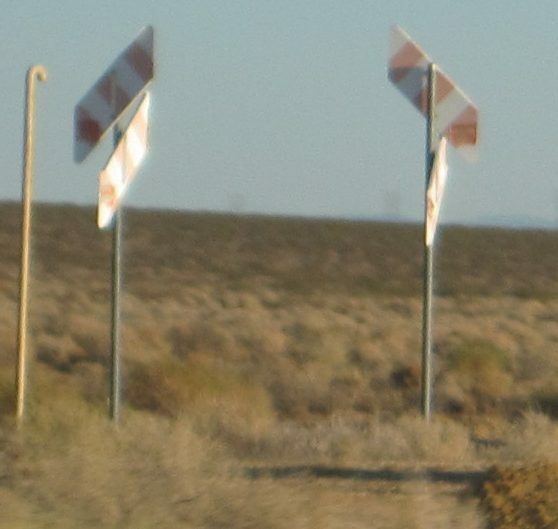 Slanted signs on dirt roads -- what do they mean? I like to travel in out-of-the-way places. On desert back roads, one often encounters mysteries of one sort or another. And the mystery under consideration today is a prosaic one: road signs. 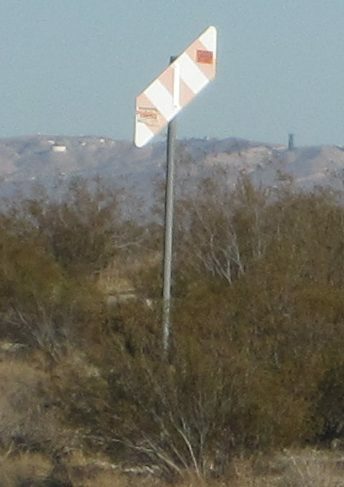 Dirt roads, especially in the desert, seldom have much in the way of signage. You're lucky if you get an occasional signpost with a BLM route number (which invariably isn't marked on any of your maps anyway). And yet, quite often out on deserted dirt roads, you'll see odd, slanted signs painted yellow with black stripes. No numbers or letters, and not every road has them. What do they mean? They don't always seem to slant the same way. I've wondered if they might point to underground cables or other hazards -- but there are usually much clearer signs for such things. Sometimes they run along a fence ... but not always. Sometimes they come in pairs -- and sometimes the pairs are at right angles to one another, or at some other angle entirely. Sometimes they seem to be aimed primarily at traffic coming from one direction; sometimes they're posted on opposite sides of the same post and clearly meant to be viewed both ways. Try as I might, I haven't been able to detect any regularly in where the signs appear or which direction they slant. And I can't figure out how to search the web. 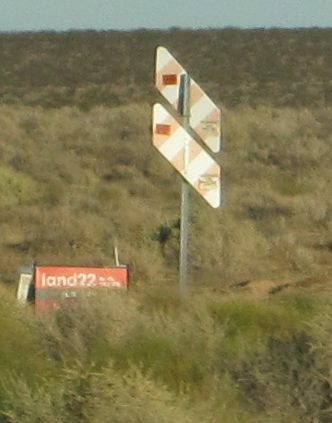 How do you search for "slanted sign with strips on dirt roads"? I've tried, but I haven't had much luck. I've found lots of compendia of standard signs for paved roads and construction areas, but nothing that covers off-road symbolism. 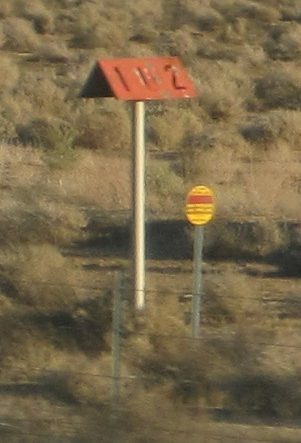 I've seen them in the Mojave, in deserts in other states like Arizona and Utah, and even a few along I-5 through the California central valley. They're clearly a widespread phenomenon, not a regional thing. Of course, there are lots of mysterious dirt road signs besides the slanted ones: I don't know what the little round ones mean either, nor the little houses on thick posts. Can anyone decode the signs and solve the mystery?